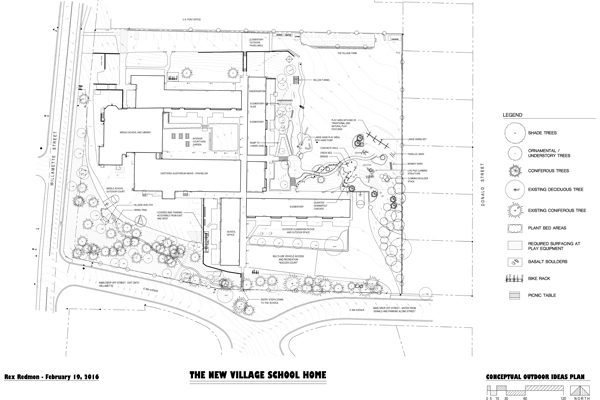 Davis Harte is a wellness design educator at the Boston Architectural College who bridges evidence and practice with work in children’s places, trauma-informed spaces, and also birth units. Visit Paradigm Spaces’ website for more information. 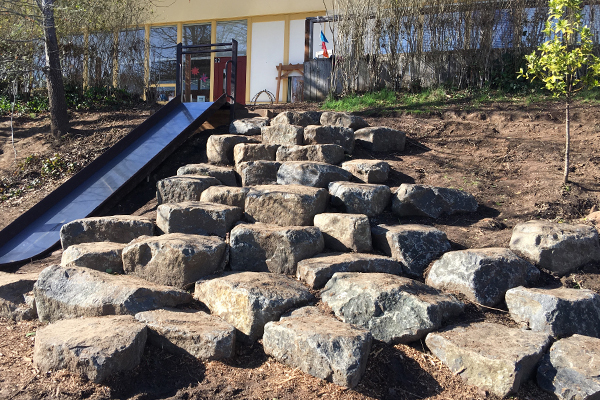 We are very pleased to have Davis share her thoughts about the Village School’s boulder scramble—a place for young children to play and be creative, while simultaneously providing a solution for serious erosion issues. Arriving at around lunchtime, I find ruddy-cheeked and joyful children playing on the Village School’s natural playground. The day is unseasonably warm, feeling more like late spring instead of mid-winter in the Willamette Valley. Rex Redmon, the landscape architect who designed the nature playground at the school, and father of two girls who attend this Eugene, Oregon K-8 public charter school, greets me near the entrance. Despite being 18 years old, the school has been in its current location for only two years. The building housing the school on the current campus is the oldest school building in Eugene, dating back to 1920. The property edges a hillside, studded with Douglas firs, ponderosa pines, and speckled in sections with poison oak near the parking lot. Landscape designer Leslie Davis joins Rex and me as we pore over the master plan for this natural playground. Our focus today is the boulder scramble, located on the northwest side of a large graded field, book-ended by a fenced-off beehive and a wooden playhouse built by third graders and volunteer parents for a previous theater production. The unique landscape design feature is the needed partner to a 3-foot wide, 15-foot long metal slide, which echoes this section’s slope. Leslie Davis and her partner and husband Aaron Davis, of Whole Gardens, conceived of and implemented the boulder scramble as the primary star in this particular story. It serves the purpose of erosion control and dry access, as well as a place to play. The slide was a ‘must-have’ for a 1st/2nd grade teacher, whose classroom door opens a few steps away from the top of the slide. The sloped area spans about 210 feet across, and was covered in invasive ivy before the transformation. The whole slope was underutilized until the slide was added last autumn just before the 2017/2018 school year began. The boulder scramble was added during winter break. 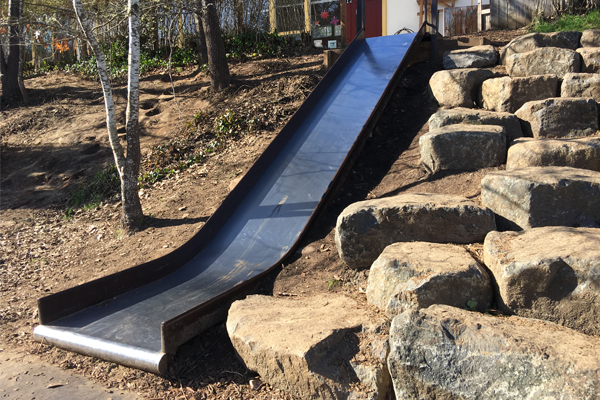 The slide, with its boulder scramble neighbor, has transformed the space into one of the most popular areas of the playspace. The Willamette Valley basalt pieces were locally sourced and planned by Aaron Davis, the stonework mastermind of the team. He is reported to have lost at least a few hours’ sleep visualizing and designing the rise and run of the scramble to optimize the risk-friendliness and appeal. 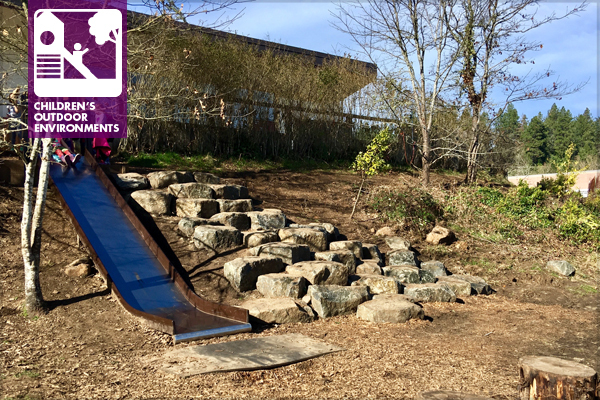 He spent multiple volunteer hours, with his excavator partner Doug, choosing the most round-edged basalt to support regular active play by children ages 5-12 years. Neighboring the slide on the north is a fenced garden, a make-do soccer field, and a small amount of play equipment in the opposite southeast corner. The school obtained a tall swing set, extra-wide monkey bars, and parallel bars from another school undertaking an upgrade. The families, teachers, and staff here are like-minded in their belief, known or not, that children also enjoy opportunities to create their own adventures. As the classes cycle out for their twice-daily recess, we watched a group of the youngest children, hot on this sunny day, carry their coats up the boulder scramble, then pair with a friend like a partner dance. While sitting on their coats, they can slip down the slide at sufficient speed for thrills, and with an appropriate gradient calculated by Rex, they arrive safely at the bottom. As one young girl climbed back to the top of the slide via the boulders, the only clear path up, she stumbled and landed on her puffy jacket, with barely a pause in her forward momentum. One important challenge the team faces is how to manage erosion control, the original impetus for creating the boulder scramble. The current pace of erosion under the slide is greater than anticipated and is becoming an unsafe distance between the slide and the ground. The gap between the top of the slide and the ground not only poses a potential fall hazard, but also creates a hiding space for children, which increases the challenge for teachers to observe everyone. Another design challenge occurred during the slide installation, when a miscommunication happened about the location for some bark mulch placement. The bottom of the slide and the ground ended up too close together, which frustrates some of the children who would like more of a drop at the bottom. Aaron Davis’ stonework planning and execution has minimized the obvious dangers for the boulder scramble, as he ensured the gaps between the rocks were smaller than the children’s small feet, and the sharp edges were minimized. This took time, a trained eye in ‘seeing’ boulders, and a gestalt level of thinking. One unexpected pleasure for the teachers has been to use the scramble as an impromptu amphitheater during outdoor learning time. A next step in the master plan development is creating a living wilderness in this active space. Landscape designer Leslie Davis is planning tough native sword ferns for the edges, forget-me-nots between the boulders, and tightly planted native slough sedge (Carex obnupta) and variegated ice dance sedge (Carex ‘Ice Dance’) to increase visual diversity for the area. The fairy houses being built in the nooks by some of the children will benefit from the additional plantscaping. Davis Harte, PhD, is a wellness design educator at the Boston Architectural College. Cheryl the height at the bottom of the slide started in compliance. School staff installed additional surfacing after initial compaction and overfilled. The excavation depth is sufficient to lower it to a correct height and maintain allowable surfacing depth.